Argeș ([ˈard͡ʒeʃ]) is a county (județ) of Romania, in Muntenia, with the capital city at Pitești. In October 20, 2011, it had a population of 612,431 and the population density was 89/km². This county has a total area of 6,862 km². The relief can be split into 3 distinctive parts. In the north side there are the mountains, from the Southern Carpathians group – the Făgăraș Mountains with Moldoveanu Peak (2,544 m), Negoiu Peak (2,535 m) and Vânătoarea lui Buteanu peak (2,508 m) towering the region, and in the North-East part the Leaotă Mountains. Between them there is a pass towards Brașov, the Rucăr-Bran Passage. The heights decrease, and in the center there are the sub-carpathian hills, with heights around 800 m, crossed with very deep valleys. In the south there is the northern part of the Romanian Plain. The main river that crosses the county is the Argeș River in which almost all the other rivers coming from the mountains flow. In the south the main rivers are the Vedea River and the Teleorman River. Dâmbovița County in the east. Vâlcea County and Olt County in the west. Sibiu County and Brașov County in the north. Teleorman County in the south. The county is one of the most industrialized counties in Romania. There is one oil refinery and two automobile plants at Mioveni – the Dacia Renault car plant, and at Câmpulung the ARO plant. Oil is being extracted in the center and in the south. Also there are a few coal mines and close to Mioveni there is a nuclear research and production facility making nuclear fuels for the Cernavodă Nuclear Electric Power Plant. 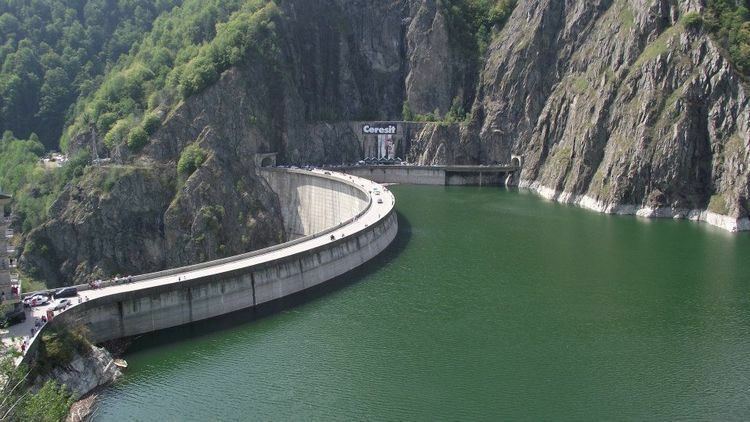 On the Argeș River there are a great number of hydroelectric power plants, the most impressive being the Vidraru power plant and dam. The hillsides are well suited for wines and fruit orchards, and the south is suited for cereal crops.